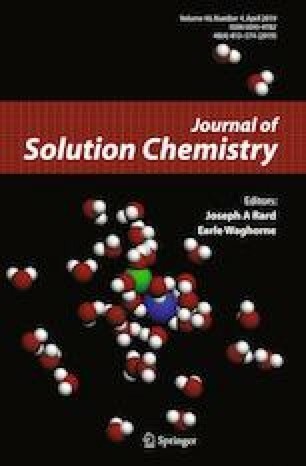 The solubility of sulfur dioxide (SO2) was measured in polyethelene glycol dimethyl ether (PEGDME) by use of a static type apparatus in the pressure range from 15.2 to 231.2 kPa at 308.18 K. The stated average molecular weight of PEGDME was Mw = 240 g·mol−1 and the molecular structure of the repeating unit is similar to that of dimethyl ether (DME). The bubble point pressure showed a negative deviation from Raoult law. The behavior was expected from consideration of the vapor–liquid equilibrium data of DME + SO2, reported by Noles and Zollweg (Fluid Phase Equilib 66:275–289, 1991). The ‘bridge-like structure’ will be microscopically formed between the DME unit and SO2, because the two unshared electron pairs of the oxygen atom in DME unit act as an electron donner for some molecules. The Peng–Robinson equation of state was used to correlate the experimental data. Two types of mixing rules were employed. One was a conventional model, and the other was of the excess Gibbs energy type. The latter, Wong–Sandler model combined with Flory–Huggins equation, showed a good reproducibility for the experimental data. This research was supported by International Project Research Grant collaboration with Takasago Thermal Engineering Co. Ltd. Company, Japan (No. 4B263).